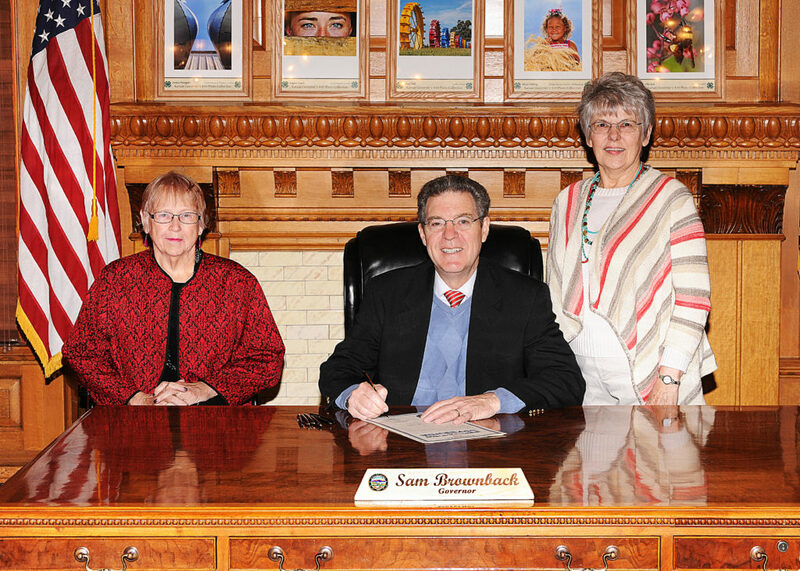 On March 22nd at the Capitol Building in Topeka, Governor Sam Brownback signed the Proclamation declaring April as School Library Month 2017. Receiving the Proclamation were school librarian, Ruth McCauley, Promotions Chair for the Kansas Association of School Librarians and Dr. Jackie Lakin, school library liaison with the Kansas State Department of Education. School libraries are active learning centers supporting students and staff in their endeavors to find current and accurate information when researching for assignments and personal needs. School librarians assist students and staff in the use of online databases, encyclopedias, primary sources and print materials. Such programs are overseen by school librarians who are instrumental in the training of students and staff. The Proclamation recognizes the contribution that certified school librarians make to increased test scores and college readiness for our students. School librarians promote, inspire and guide students in their quest for knowledge and encourage a love of reading. Every day, students are encouraged to explore and take advantage of the services offered at their school library. It is not the quiet place you once expected! Fun activities are always going on there – Book Fairs, Poetry Contests, voting for the William Allen White Book Award, class displays, digital creations, computer coding among many other things. You will need to check-it-out!